I’ve become a big fan of Instagram. Sadly I remain exceedingly unartistic myself when it comes to photography and visual art, but I’m discovering some fabulous business and personal accounts on Instagram and – more importantly – some very talented people! I don’t even know how I stumbled across Maryborough’s Karen M Andersen but I was immediately taken with her art and started planning my eventual purchase of one of her pieces. Karen’s refreshingly honest online (you can follow her on Facebook, Instagram or check out her website) about her experiences with depression and anxiety. And she openly talks about the benefits of using art as an outlet for her emotions and creative energy. I had the opportunity recently to meet her and talk about her work. As Karen notes on her website, she’s always loved art but grew up in the era when it wasn’t really seen as a ‘vocation’. It was a hobby, not something to pursue career-wise. Fortunately Karen was also passionate about biology and science and left her hometown of Maryborough to study at Rockhampton’s Central Queensland University in 1993. It didn’t entirely work out for Karen and ended up being the first time she was diagnosed with depression and anxiety. Karen says there was still a lot of stigma around mental illness in the 1990s and anyone over 30 or so will certainly agree that it’s taken a loooong time to recognise its debilitating effects, and the importance of appropriate treatment. In the meantime Karen started a family (her two children are in their mid teens) and although she continued to pursue her creative interests (drawing and art journalling) during this time, it still wasn’t something she saw as anything other than a hobby. In 2016 Karen travelled to Rockhampton to a Ken Done exhibition. Inspired she signed up for a Masterclass run by Done – which was the first the popular artist had conducted. Karen came away from that with a renewed passion for her art and a confidence which surprised her. “I don’t know where that determination came from,” she said. Since then Karen’s more vigorously pursued her art (she works with acrylics on canvas and, as a non-artist, I was surprised at the complexities of surfaces, primers, textures and hues). Karen now sells her magnificent abstract work via her website. I admired a piece of Karen’s work recently (via Instagram) but she responded that it was not yet ‘finished’. I was intrigued and wondered how one knows it’s finished? (Did I mention my ignorance when it comes to ‘all things art’?) Is there a temptation to edit and edit and edit – which is something many of us who write struggle with, I asked. Karen agrees that’s certainly the case. She says she still experiences doubt sometimes, but she heeds Ken Done’s advice that there’s nothing that a bit of white paint can’t fix. Though she hasn’t been putting herself or her work ‘out there’ for long, her talent is already starting to be recognised. She recently won second place at the Hervey Bay Regional Gallery’s Hidden Wonders Art Exhibition and her work has been selected for future exhibitions. I love that she continues to be inspired by her surrounds – our beaches, rainforests and reefs. And she finds painting therapeutic and a way to express and explore her emotions. I again confessed my artistic ignorance to Karen in admitting that I just love the colours of her work. I’m not a particularly visual person but even I can tell that Karen adding a patch of white to a vibrant piece somehow improved on what I thought was already finished. I’d suggest following Karen on social media or checking out her website if you appreciate beautiful things, love colour and take inspiration from other’s creativity and talent. I look forward to seeing more of Karen’s work on display around the Fraser Coast and beyond. For more information on Karen or to buy her work, check out her site: Karen M Andersen. Pictures all from Karen's Instagram account. 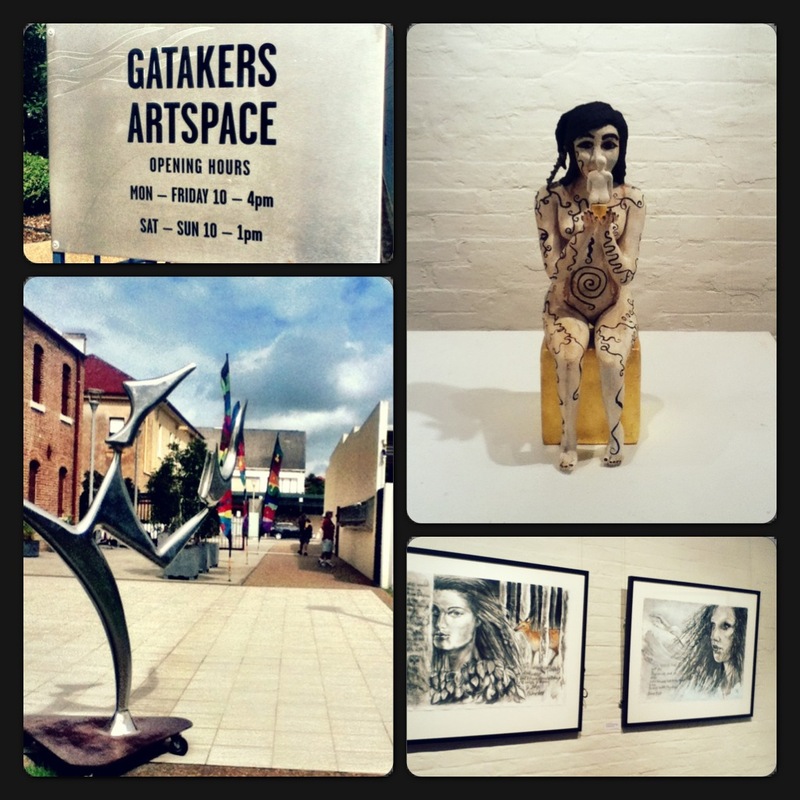 I’m embarrassed to confess that it took me six months of being back on the Fraser Coast before I ventured to Maryborough’s trendy Gatakers Artspace and precinct. Sadly time didn’t permit an excessive amount of sightseeing so I skipped the Bond Store and the Military & Colonial Museum (which I’ve also visited previously); but as the much beleaguered Muddy Waters Cafe was reopening after repeated floodings and a new art show, by local artist Gina Davey was being launched, I figured it was a good time to pop down there. I’d been to Gatakers Artspace years ago and decided then that I could indeed live in the venue. Its renovation / refurbishment reminds me of some high spec house which should be featuring on Lifestyle TV or the like. I must confess (though) to being a bit underwhelmed last time I visited the gallery – with mostly local knitting on display. This visit however, was much more fruitful, with Davey’s Person of Interest exhibition featuring downstairs and an array of artwork and sculptures upstairs. In fact I was so mesmerised with a series (by a local artist whose name I’ve forgotten – in bottom right corner of pic) that I even contemplated whether my current state of poverty would permit me to buy one of the pieces. 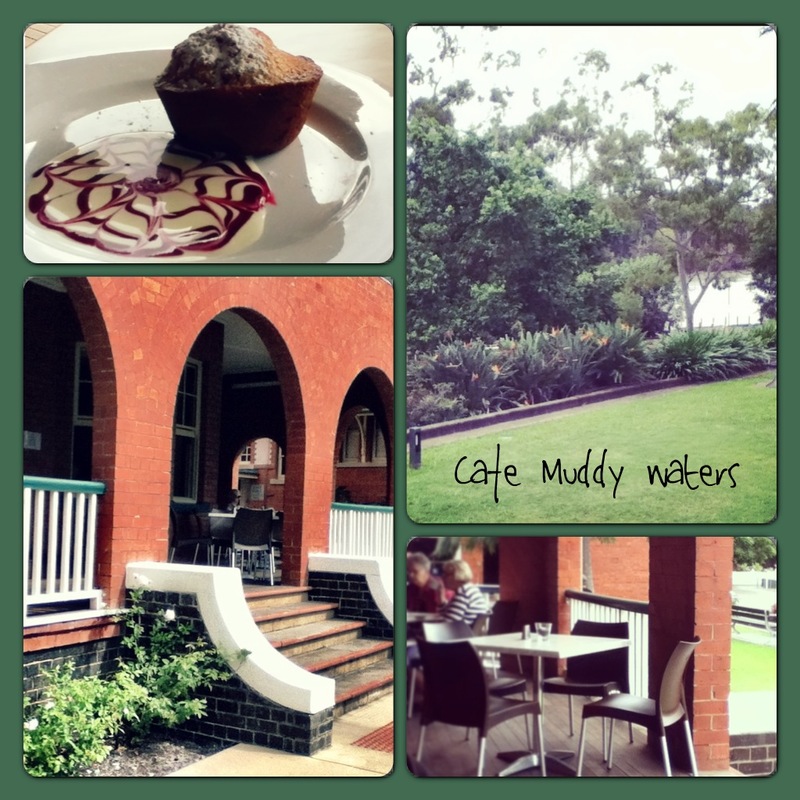 I was keen to show Muddy Waters Cafe some support after the bad luck they’ve experienced. I know that building by a river is fraught with danger, but am pretty sure they didn’t expect five floods in three years. The Cafe is now in the Customs House building (home of the former Port Residence), which offers some pleasing views. Owners Michael and Mia Cox say they are starting small; they are yet to get their liquor licence and only open from 9 – 4 (Tuesday – Sunday) at the moment. I’ve decided I’ll cut them some slack, as they’re still getting started, but in my case – as a coeliac – gluten-free options were very limited. In fact they were practically non-existent. The helpful waitress said that they could just remove parts of a dish, but it seemed wasteful to pay for something and only receive half of it and nothing tempted me anyway. We were also offered the breakfast menu (all day breakfast I assume) but again there was no GF bread and they were unsure about the chorizo and bacon. It’s not cheap and I have to admit I won’t be rushing back at this stage. I’ll keep an eye out though because if their menu expands, it is a nice spot and might be worth a second chance. I know people thought well of it previously. 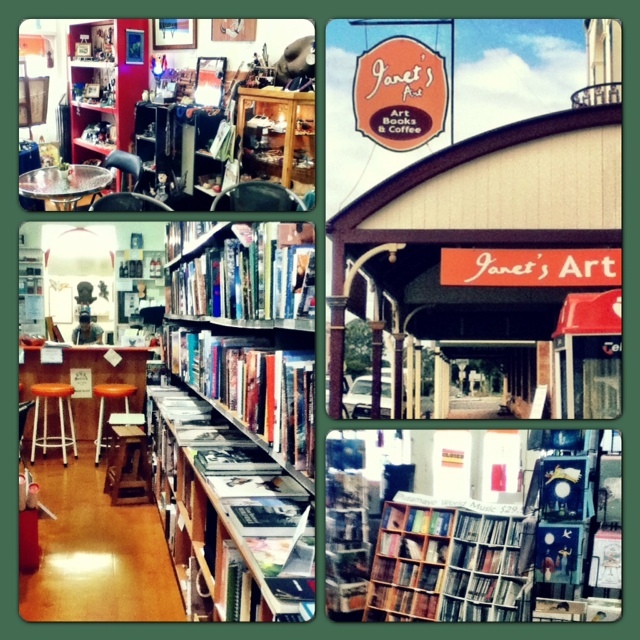 On the suggestion of my mother and a few locals I also visited Janet’s Art while at that end of town. And… Oh. My. God. I was super-impressed. “Atmosphere and gluten-free options galore!” I tweeted afterwards. I saw several things I was keen to buy, but only left with some cards (Mother’s Day was approaching!). I picked up a takeaway menu and was pleasantly surprised at the array of GF options on offer. There’s a lovely space out the back which should prove nice during winter and I love that the store supports local artists and jazz. I’m keen to return to the precinct to make it to Gatakers by Night, which is staged from 5-9pm on the last Saturday (of each full weekend of the month) and features music and artists-in-action. And it’s nice to see that the beautiful space is being put to good use.